← Warner House Part 1: A Museum. Open. In New England. In May. 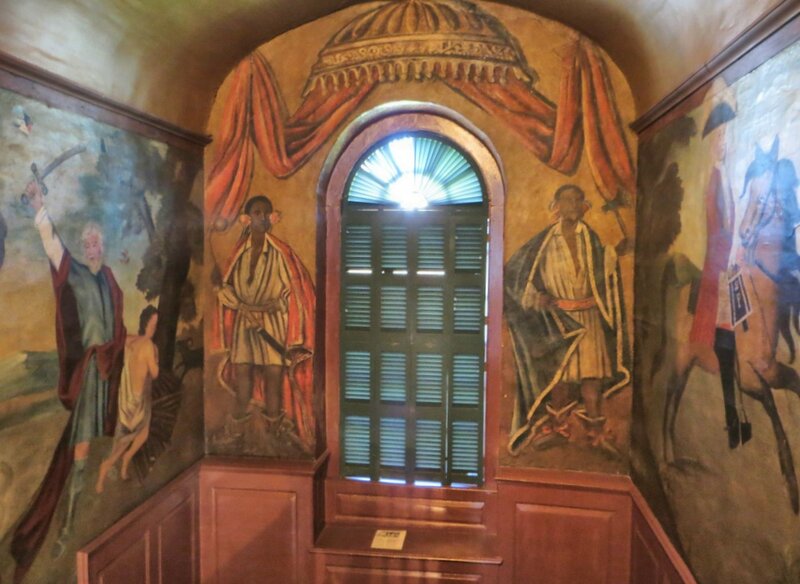 The first thing that caught our eyes when we entered the Warner House in Portsmouth, NH was a mural that covered the staircase wall, winding its way up to the second floor. It didn’t hurt (relative to dog-crazy me) that the scene in the entry hall features a dog. “We’re not sure what it means,” said our guide, Sandra. “It could be the Odyssey, with Penelope at the spinning wheel and Odysseus as the eagle.” Odysseus’ dog is the one who recognizes Odysseus when he returns home after 20 years absence, so all the elements seem to fit. 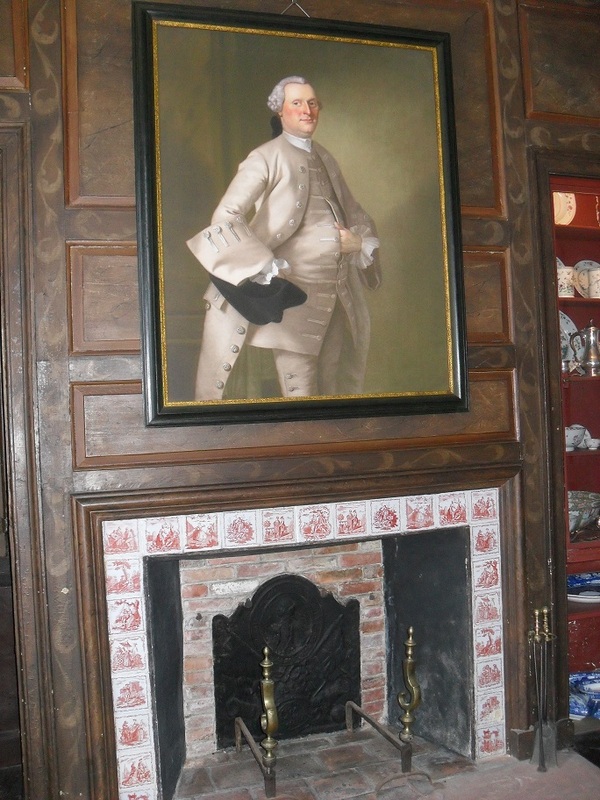 The murals were painted not long after the house was built, around 1718. No one is sure, but experts posit that it was painted by Nehemiah Partridge (1683-1727), a Portsmouth artist whose father was a friend of Warner House builder Archibald Macpheadris. One or two topics or themes generally peak my interest more than the others during a tour and those themes usually readily reveal themselves. I use them to edit the overwhelming amount of information I gather on a site so that I can describe my experience in about 500 words. Not so at the Warner House. Furniture, family, preservation efforts — it was all compelling. “What should I do?” I asked Kathie. Her answer was almost immediate. “Write about the wall treatments,” she said. And she was right. What grabbed both of us from the second we saw the dog on the stairway wall — what we’ll remember no matter how many other 18th century houses we’ll see — were the wall treatments. Three in particular were memorable. The second is the sitting room. When the last private resident of Warner House died in 1931, family members began taking away the furniture. One piece to go away was a large bookcase that had been in the same position since 1765. And removing it revealed a hand-painted wall, with paisley-esque borders outlining marbelized panels. A 1939 restoration brought the painted walls back to the entire room (and in 1980, the bookcase returned too). 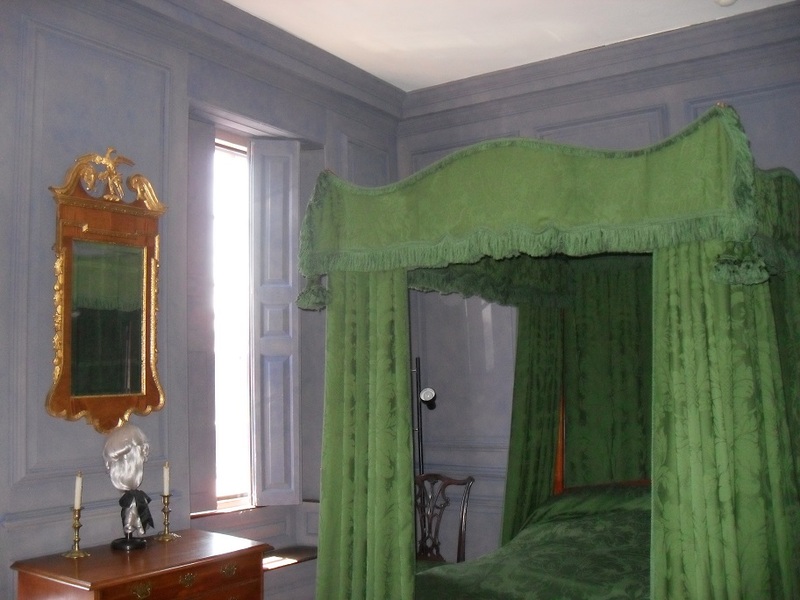 The third is Jonathan Warner’s bedroom, which is a blue that seemed to … glow. “It’s smalt,” said Sandra. “Smalt,” said Kathie. Of course she’d know. She was the one, you may remember, who recognized the chief archeologist of Historic Jamestown. Smalt was used as a decorative accent in the late 17th and early 18th centuries. So the Warner House staff was surprised when they did an analysis and found that all the walls of the room, plus the doors, plus the shutters, had been smalted. There aren’t any other examples of smalt-covered rooms in the US or England, so Jonathan may have been a man of unique vision. It sounds like you’d end up with a pebbly wall version of popcorn ceilings. But the glass is ground so fine that it’s hardly noticeable, even very close up, and it presents as a beautiful, restrained blue with a twinkle. Kathie and I left the Warner House after two hours, with a million details bouncing around in our heads and a book on the Warner House to keep them all straight. We saw things that we — with several hundred historic houses visited between us — had never seen before. And while the regular public tour may not be as long and as thorough as the private one that we got, I feel pretty secure in saying that you’ll see things at the Warner House the like of which you’ve never seen before, too. *Credit for the photos to Kathie. My camera hates me. Gallery | This entry was posted in New Hampshire and tagged Archibald Macpheadris, Jonathan Warner, murals, Portsmouth historic house. Bookmark the permalink. Wow, I’ve never heard of smalt before, much less seen it. What a cool idea. Those murals are beautiful! I know! I’m surprise that it’s not all over HGTV. If I were an interior designer, I’d be all over it. Glad my photos were useful! 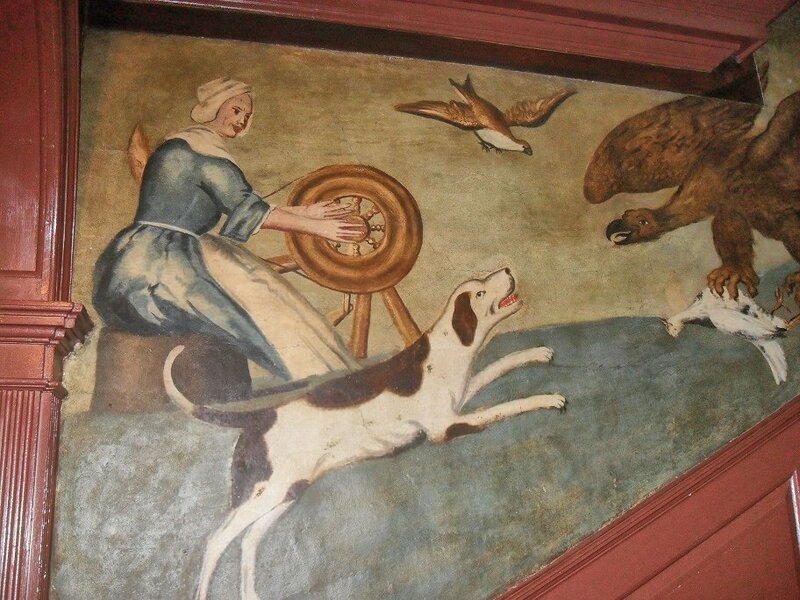 When I first saw the murals in the hallway, I was fairly familiar with the 19th century itinerant mural painters (Rufus Porter, etc), but I had no idea anyone in New England, no matter how rich, had full wall murals at the beginning of the 18th Century. Have to say I love the concept of putting the ground glass on the wall, no matter how impractical. Ms. Rux told us the underpainting was a bright pink, and the crushed glass cobalt blue, and the finished result was stunning. When hit by sunlight, firelight or candlelight it must have seemed magical to the original owner and his visitors. Definitely decorating to impress! I didn’t remember about the pint underpainting. Maybe that’s why my photos of the walls came out purple. That was really interesting. I even broke decorating Partner off the football to have a look at those piccies and have a discussion on smalt. It sounded like esmalte to me, which is a finishing paint in Spain. For some reason I had in my head that it would be for enamel work. Or maybe I’m thinking about it also being Spanish for nail varnish! Reading up about it, it seems that it was regularly used for murals so maybe he got the idea from that. But apparently it fades – did the walls look faded, or does it get touched up from time to time? And, from the photo, could just be the light, it looks slightly scumbled rather than a uniform finish, was it? It doesn’t look glittery, so was there any shine to it? The photos really don’t do it justice. It was much brighter and sparkly when we saw it in person. I believe that it does get refreshed when it needs it, though. And the paint job wasn’t uniform — I just assumed that it’s the way that it was supposed to be (and not just a bad paint job, like I’d do).